The latest report issued by the United Nations’ Intergovernmental Panel on Climate Change on October 8 is the starkest report to date on the real and immediate threat that global warming poses to human existence. The report finds that if greenhouse gas emissions (GHG) continue at the current rate, the atmosphere will warm by as much as 2.7 degrees Fahrenheit (1.5 degrees Celsius) above pre-industrial levels by 2040, submerging coastlines, intensifying droughts and wildfires, increasing the frequency and strength of extreme storms, and worsening food shortages and poverty. Perhaps the most attention-grabbing aspect of the report is that these dire consequences will come to pass well within the lifetime of much of the global population. 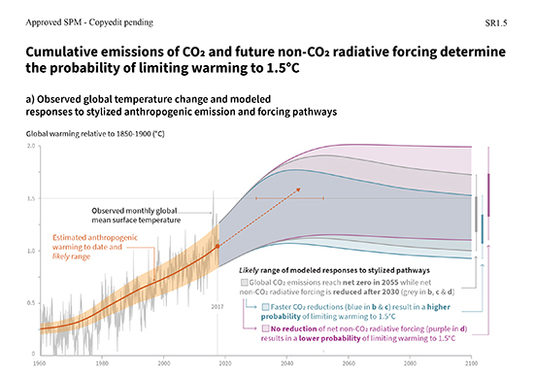 While similar warnings about the consequences of continued fossil fuel consumption have been issued in the past, efforts to cut carbon and other GHG emissions to a climate-safe level have been largely defeated in arenas ranging from the United Nations to the U.S. Congress. Corporations and other powerful political actors have been the dominant factors in this process, but many other people and institutions have pursued short-term self-interest at the expense of climate protection, often in pursuit of their own economic survival. For example, local communities and workers dependent on fossil fuel industries have campaigned to weaken climate protection legislation and block international climate agreements. However, local communities and workers are also the primary victims of climate catastrophe as has been witnessed in the aftermath of Hurricane’s Katrina, Maria, and Harvey and Superstorm Sandy. In fact, the working class is always hit first and worst by climate change, particularly those who are already most hurt by our economic and political systems: women and people of color. It is for these reasons that some in the labor movement have been building an independent, working class climate movement that challenges the governments that permit climate destruction, the fossil fuel producing and using industries that conduct it, and the corporations and other institutions around the world that collude with it. These labor climate activists are promoting solutions. Above: Madeline Evans of Henryville, Ind., walks the parking lot of her elementary school, March 3, 2012. 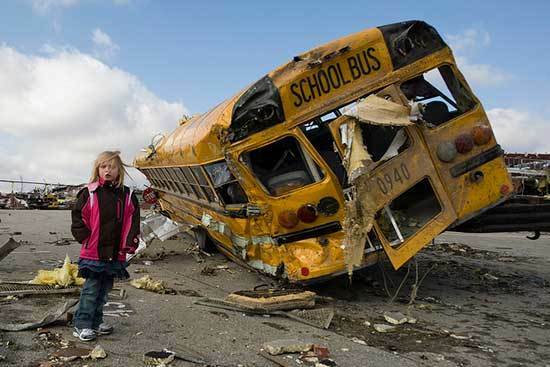 The school and much of her town was devastated by a large tornado the day before. The Indiana National Guard activated more than 250 Soldiers from across the state to come to the aid of the community. (Indiana National Guard photo by Sgt. John Crosby). Used with permission by Creative Commons. To be blunt, climate change poses an immediate existential threat to our species, to every individual, and to all that any of us hold dear. For this reason, protecting the earth’s climate is in the long-term interest of all humanity and we in labor, as the organized voice of the working class majority of the planet, must take a leading role in this struggle to put the interests of people before profits. It is to this end that the Labor Network for Sustainability (LNS) has been organizing a series of local and national “labor convergences” on climate around the country. Activists in Los Angeles met in July to strategize about ways to build the labor movement into a force for climate protection and justice. In the Northeast, labor-climate activists from Maryland to Maine will converge at the Labor Education Center at Rutgers University in November. The Convergence will encourage climate protection advocates to organize locally and nationally in their own unions; encourage climate solidarity with workers around the world; build cooperation among climate protection advocates and caucuses in different unions; educate labor’s leadership and rank and file on the realities of climate change; transform the discourse and ultimately the policy of the labor movement; and bring local labor unions and activists into engagement with climate and climate justice organizations and activists in their own communities. As workers and trade unionists, we can either initiate change or be the victims of it, or worse yet, suffer the consequences of inaction. We choose the former and thus resolve to use our power to reshape economic, political, and social systems in the interests of all the world’s people who are threatened by climate change. 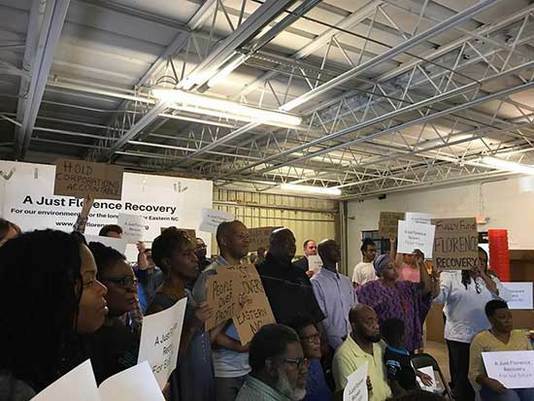 Black Workers for Justice penned an inspired piece calling for action, optimisim and change in the upcoming election in the aftermath of Hurricane Florence. Full text below. The winds and rain of Hurricane Florence and then the floods have devastated our communities. We have had to leave our homes, many of which have been destroyed, as we suffer all of the pain of being displaced. Many are without food, water, necessary medications, and clothing. We have loss cherished family memories. But we have not loss our dignity. As predicted by community and environmental justice organizations, numerous hog waste lagoons have been breached spreading toxic waste across our communities. Environmental racism is responsible for the harm the Pork Industry has done eastern North Carolina Communities. Smithfield Foods must be held accountable for their failure to guarantee safe waste systems on the farms that they contract with. And we must come to the aid of the community members and activist who have long been defending the community against this harm. The N.C. communities that had been endangered by Duke Energy dumping its coal ash warned against the dangers of these 50 poison ponds. The flood waters after Florence have resulted in two of these pits leaking arsenic, mercury, lead and more into the Neuse and Cape Fear Rivers. Duke Energy said we are safe. We don’t believe them. There is no dispute that global warming is responsible for the nature and frequency of these recent hurricanes. The continued burning of coal will only worsen these conditions. Energy corporations like Duke and their backers in government must be stopped if we are to avoid continuous disasters. We cannot lose sight of this as we struggle to survive. The elected officials in office now bear responsibility for these problems. As survivors and activists we have to hold them accountable.The massive displacement and necessary preoccupation with recovery will be used by the Legislature to further suppress the votes of people of color and poor people. We have to demand special measures for people to vote wherever they are. Recovery policy by the state must not only include assistance with housing, cleanup, etc. but also must address the demands to end hog waste and coal ash crimes against the people. Join the fight for a Just (as in justice) Florence Recovery! Above: LA County Federation of Labor President Rusty Hicks speaks in favor of improving LA’s storm water systems and committing funds to disadvantaged communities and ongoing maintenance to generate jobs and workforce training. 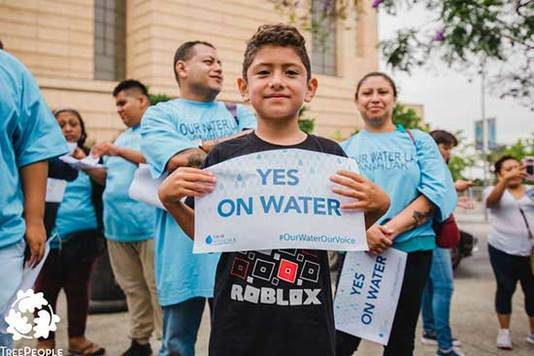 Recently, Los Angeles labor unions have put their weight behind Measure W for Safe, Clean Water on the November 6, 2018 local ballot. Measure W proposes a county-wide parcel tax of 2.5¢ per square foot of impermeable surface to raise an estimated $300M per year to invest in improving LA’s water systems, mainly, to better capture and manage stormwater and reduce urban runoff. The region, hot, dry and water-scarce, and unfit for accelerated population growth, has been challenged by water shortages for more than 100 years. Bloody disputes ensued as settlers constructed aqueducts that took water from California’s Eastern Sierras, and have since depleted the Owens Lake entirely and erased the Northern Paiute’s way of life. Today, two thirds of the region’s water are imported from the Owens Valley, Northern California, and the Colorado River. Spearheaded by Los Angeles Alliance for A New Economy (LAANE) the Our Water LA coalition started with communities, advocacy groups, environmental, and environmental justice organizations. Unsafe drinking water, polluted waterways, deadly flood events, toxins and plastics washed into the Pacific Ocean and onto beaches were reasons for finding long-term solutions. In the most populous county (roughly 10 million) in the United States, public infrastructure projects would, for example, install permeable sidewalks and drainage swales in neighborhoods, design parks with water storage, and retrofit playgrounds. These solutions would not only improve the quality of life of residents by increasing access to clean, safe water, but also generate as many as 9,500 jobs, according to a study produced by LAANE. 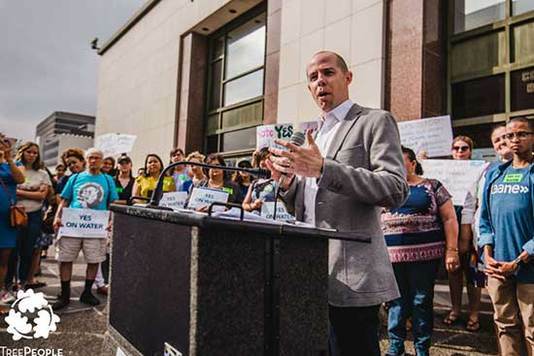 At a hearing with the Los Angeles County Supervisors this summer, labor joined in to advocate for a prudent policy that understands water shortages, worsened by climate change, put firefighters in grave danger. Los Angeles County Fire Department Chief Daryl Osby noted “Climate change is real!” and extended periods of drought followed by a year of heavy rain have made wildfires more frequent, intense and urban-proximate, endangering the county’s population and his workforce. Executive Secretary of the Los Angeles/Orange County Building Trades Council Ron Miller specified the importance of sustainable water management and potential opportunities for Pipe Trades, Plumbers and Electrical workers. Among other labor representatives, LA County Federation of Labor President Rusty Hicks spoke in favor of improving LA’s storm water systems and that committing the funds to disadvantaged communities and to ongoing maintenance will generate jobs and workforce training where they are needed most. Currently in campaign mode, LAANE organizers are conducting outreach and educational presentations to union locals throughout the region. As a ballot measure, W will be up to LA county voters. Resting in their hands is a choice to make stormwater capture and reducing runoff a priority for the people and the planet. Veronica Wilson is an LNS member and consultant who most recently organized the first Los Angeles Labor Convergence on Climate Change. For over two years, unions across Washington State have been part of the Alliance for Jobs and Clean Energy. It’s an historically broad coalition of labor, environmental, health, business, faith, and social justice advocates coming together to build a more equitable, clean energy economy. As we’re witnessing the clear-cutting of common sense environmental policies at the Federal level, states initiatives like this one in Washington offer hope for a more sustainable future. The coalition aims to put a price on carbon — something no other state have done yet. 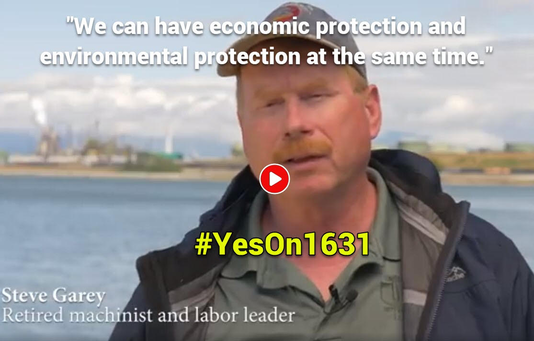 Our ballot initiative 1631 imposes a fee on the states largest polluters. It starts at $15/ton and rises by $2/year, raising an estimated $1 billion annually to invest in clean energy, forest health, manufacturing, and good paying jobs built to last. There are also funds set aside to help others transition through job training and wage assistance as well as dedicated protections for workers to ensure their jobs stay in Washington. In addition, 35% of investments must be targeted to low income neighborhoods and communities of color to ensure that everyone has access to a cleaner, healthier future. Our coalition faces opposition from big oil companies like Phillips 66 and BP, and the Koch Brothers, amassing over $21 million. Those are record-breaking contributions intended to maintain their control of the energy economy, and 99% is out-of state. 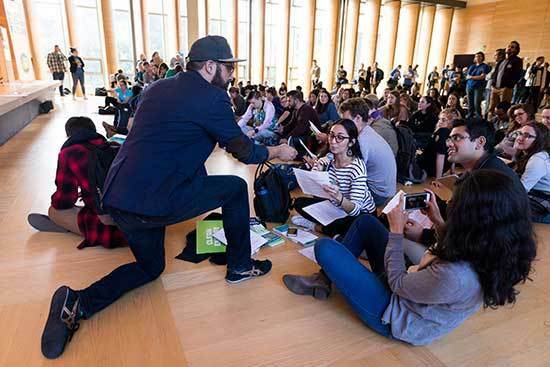 UAW 4121, the union of over 4,500 academic student employees at the university of Washington, is one of the unions on the Yes on 1631 steering committee. We know that the impacts of unchecked climate change will disproportionately impact young people, and are leading campus-wide voter registration and GOTV efforts to drive up student participation in this midterm election. 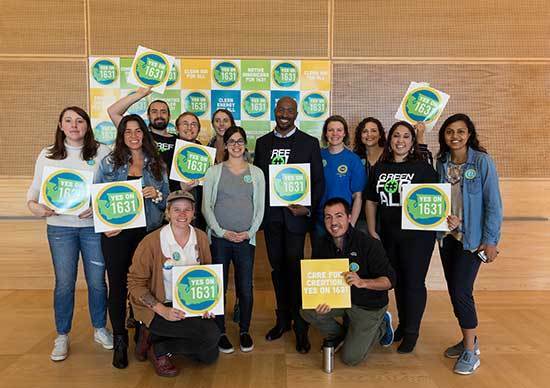 To learn more about the initiative, and how to help turn out the vote for this historically inclusive climate initiative, visit yeson1631.org. If your union can host a labor-to-labor phone banking event to help get-out-the-vote, email judytwedt@gmail.com. A 1631 campaign event hosted by UAW4121 and Green for All with guest speakers including CNN Commentator Van Jones, music artist Macklemore, and President of the Quinalt Nation Fawn Sharp. 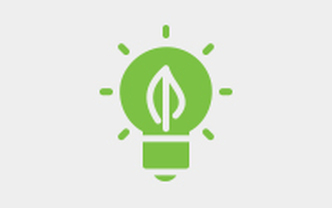 The Labor Network for Sustainability is honored to have Elizabeth Bunn join our staff. Elizabeth is currently working in Maryland to oversee labor and climate efforts. 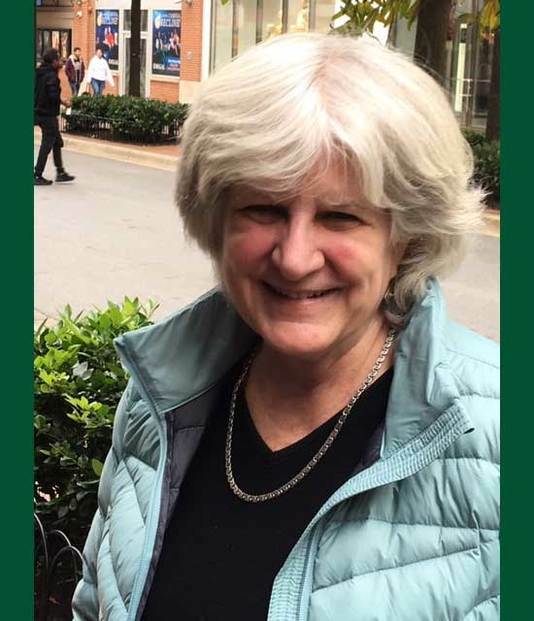 Elizabeth Bunn is the former Director of the Organizing Department for the AFL-CIO having been appointed by AFL-CIO President Richard L. Trumka in February 2010, and having retired in 2017. Prior to becoming Organizing Director, she held the position of Secretary-Treasurer of the International Union, UAW, a post to which she was first elected in 2002 and re-elected in 2006. This is the highest position held by a woman in UAW history. She previously served as Vice-President of the UAW, a post to which she was elected in 1998 and served until being elected Secretary-Treasurer. As Secretary-Treasurer, in addition to her duties as the chief financial officer for the UAW, she oversaw the UAW’s non-manufacturing organizing initiatives since 1998. In that capacity, she secured bargaining rights for more than 18,000 academic student employees at both public and private universities, supervised campaigns among contingent faculty at several universities and successful representation elections for thousands of gaming employees. She was also responsible for the organizing and bargaining of thousands of public employees. She negotiated landmark provisions addressing work-family balance and extending benefits to domestic partners. As Organizing Director of the AFL-CIO, she has worked with affiliated unions to build their organizing capacity. In addition, under the leadership of President Trumka, the Organizing Department has accelerated global campaign initiatives, partnering with the global labor movement to counteract the power of multi-national corporations and to address head-on the effects of the unlimited mobility of capital. The Department has also strengthened relationships with community allies in support of organizing and has worked to assist the hundreds of thousands of workers outside the scope of traditional labor laws as they engage in self-organizing to build power in creative, non-traditional ways. Additionally, the Department has initiated innovative approaches to linking support for immigrant workers with worker organizing campaigns which has also helped create a pipeline for young Spanish speaking organizers into the labor movement. Under Ms. Bunn’s leadership, the Department has spearheaded multi-union, industry-wide organizing efforts in support of working people, including the innovative and ambitious Jobs to Move America (JMA), which uses public policy to spur investment in good-paying, high road employment in passenger rail and bus manufacturing in the United States and along the supply chain. The JMA coalition effort has resulted in the first neutrality/majority sign-up agreement between a union and a Japanese manufacturing company operating in the U.S. Coalition efforts have also resulted in the commitment by the Chinese company, China South Railway Sifang to open a new assembly facility in the south side of Chicago, the first in decades.